University of the Arts London (UAL) celebrated a historic first this week, as students graduated from two UAL Masters programmes delivered outside London for the first time. Based in Hong Kong, the students are the first cohort of graduates from UAL’s MA Arts and Cultural Enterprise (Central Saint Martins) and MA Media, Communications and Critical Practice (London College of Communication) delivered by UAL accredited partner institution, HKU School of Professional and Continuing Education (HKU SPACE). 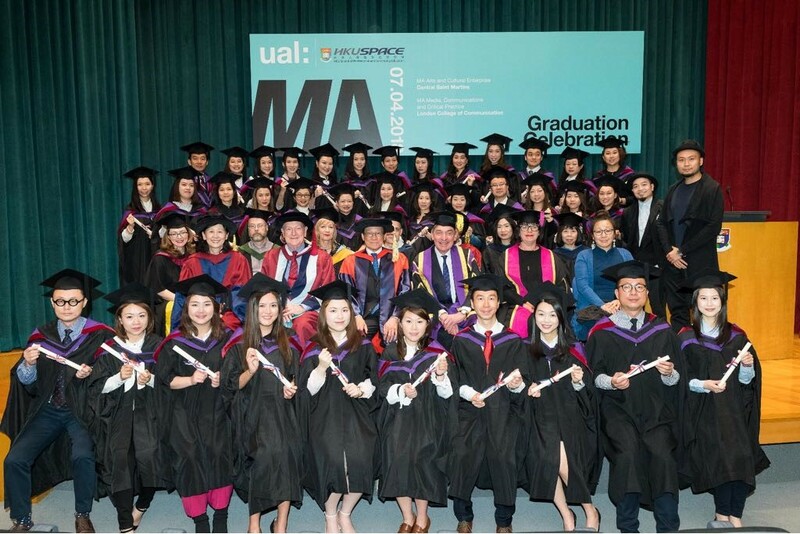 “Welcome to this joyful celebration of the success of students from MA Arts and Cultural Enterprise (Central Saint Martins) and MA Media, Communications and Critical Practice (London College of Communication), based in Hong Kong. The UAL and HKU SPACE partnership began five years ago, addressing the need for multi-skilled professionals, executives and entrepreneurs in Hong Kong’s arts, cultural and creative sector. The programmes are taught simultaneously in London and Hong Kong, and combine face-to-face and online sessions so that students can benefit from the exchange of ideas locally and internationally. The UAL Masters programmes were launched in 2015 in recognition of the increasing market demand for talents in the field of arts, creative and cultural management. Hong Kong is home to over 2,000 UAL alumni, and more return home or choose to re-locate there each year. The new graduates will be encouraged to join UAL’s Hong Kong global alumni network which builds social and professional links for UAL graduates living in Hong Hong. Read more about UAL’s MA Arts and Cultural Enterprise (Central Saint Martins) and MA Media, Communications and Critical Practice (London College of Communication).